Excerpted from Trade Secrets from Use What You Have Decorating by Lauri Ward. Figuring out where to put your furniture is like trying to complete a jigsaw puzzle. What you imagine in your head or on a floor plan often doesn't come out the way you'd hoped it might. That's when decorating anxiety usually starts to kick in. Fortunately, there are some basic rules that will help you avoid aggravation and save you both time and money. 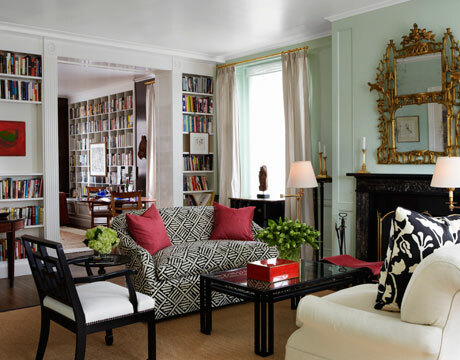 When arranging your seating, a U-shaped conversation area is ideal, while an L-shaped area is always uncomfortable. A sofa and a matching pair of chairs easily establish a comfortable U-shaped configuration that allows everyone who is seated to have an intimate chat facing everyone else. A sectional sofa or a sofa and loveseat that form an L-shape, on the other hand, make everyone "twist and shout" when trying to have a conversation. Almost every living room has at least one natural focal point. If yours has a fireplace, that will no doubt be it. Other focal points might be a picture window with a wonderful view or a pair of French doors. Whatever the focal point of your room, be sure you arrange your furniture to take advantage of it -- since everyone's eyes will naturally be drawn to it in any case. To create a beautiful room, think in pairs. If you have a good piece without a mate, find it a partner. End tables will complement each other if they are of similar size and finish. Two different upholstered chairs can be slip-covered in the same fabric to create a pair, so long as they are of similar height and scale. Fit two lamps of similar height and style with new, matching shades. Is your entrance foyer or vestibule too small to accommodate a commode or table? Try a narrow bench instead. It will be handy for setting down packages and sitting on to remove wet boots. Be sure you living room chairs and sofa are grouped close together. Otherwise, anyone walking through the living room will be forced to cross between those who are seated and interrupt their conversation. If possible, avoid having the traffic pattern cross in front of the television. To keep from blocking anyone's view, try to reconfigure the seating so that someone "passing through" will be walking behind the sofa instead of in front of it. In small rooms, use armless upholstered chairs such as slipper style, which will allow more space than chairs with arms but will provide a more comfortable, small-scale alternative to wooden chairs. If your budget won't allow you to buy a pair of matching chairs, purchase one chair and a matching ottoman. Until you can afford the second chair, use the ottoman as a "second" seat by placing the chair on one side of your coffee table and the ottoman on the other side. You'll have two places to sit with the effect of a matching pair.